Portland State University Library joins with Dark Horse Comics and the Will & Ann Eisner Family Foundation to recognize Will Eisner Week 2015, an annual series of events that celebrates graphic novels, sequential art, free speech, and the legacy of Will Eisner, one of the most innovative figures in the history of comics and graphic novels. 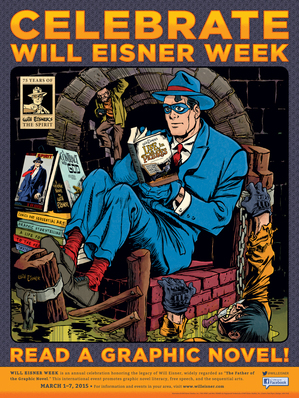 This year Will Eisner Week is March 1-7. Will Eisner Week 2015 marks the 75th anniversary of the 1940 debut of Eisner’s signature creation, The Spirit, which revolutionized comics and established Will Eisner as a giant in the medium. During Will Eisner Week 2015, the Library has a display of Will Eisner’s books as well as The Spirit figurine. There will also be a screening of the documentary Will Eisner: Portrait of a Sequential Artist followed by a brief intermission and a panel discussion of “Eisner’s Legacy,” with participants Matt Wagner, Douglas Wolk, and Susan Kirtley, and moderated by Brian Michael Bendis. The documentary will be screened from noon to 1:45pm, with the discussion at 2pm, on Friday, March 6 in Cramer 53. Will Eisner (1917-2005) grew up during the Great Depression in the tenements of the Bronx. He was a pioneer in the creation of comics during the “Golden Age” of the 1930s and ’40s, achieving fame with his noir crime-fighting superhero, The Spirit. At one time or another, many comics greats worked with Eisner including Jules Feiffer, Wally Wood, Jack Kirby, Al Jaffee, Mike Ploog, and others. After The Spirit ceased publication, Eisner devoted himself to producing educational and instructional sequential art, a term he coined. In 1978, Eisner once again reinvented himself, and the medium, with his graphic novel A Contract with God. Other notable Eisner graphic novels include To The Heart of the Storm, A Life Force, Last Day In Vietnam, Fagin The Jew, and The Plot. Will Eisner’s graphic novels and textbooks are still in print in 15 worldwide languages. The prestigious Will Eisner Awards, the “Oscars of the Comics Industry,” are presented at San Diego Comic-Con, the world’s largest comics convention.